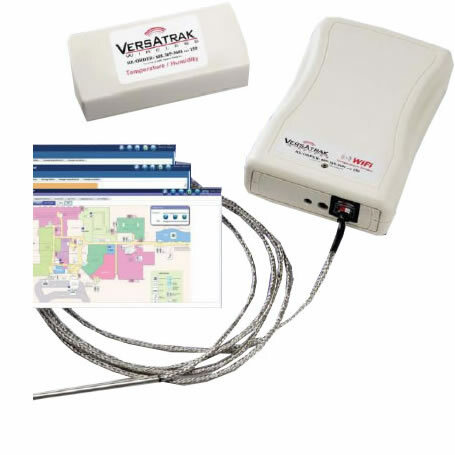 Versatrak wireless monitoring hardware is designed to easily integrate into different wireless communications systems. This means existing 802.11 wireless technology likely can be utilized by Versatrak. With a VersaTrak system, all critical devices with in your system can be monitored for temperature, humidity, pressure or just about any other critical metric. Even in off site situations VersaTrak can give you that 24/7/365 documentation and alerting you could never have before. With one system, each department sets up their notification methods, temperature ranges and all other functions completely independent of what any other department is doing. Decrease product loss, increase effeciency and productivity all with one product. If you are in Pharmacy, Lab, Nutrition, Facilities, Bio-Med or just about any other area of the hospital, there is something you need to monitor. Call us, let us tell you how VersaTrak can fill you need. We are the only system that works with WiFi and 900 MHz systems. Have an existing 900 MHz temperature monitoring system, call us. We may be able to upgrade your fuctionality and keep all you exisitng data and hardware.